All through the centuries, rings have been used as token symbols for many different things. In ancient times, some gems were thought to have mystical powers, the ability to heal illnesses, or the power to ward off evil spirits. These stones were set in precious metals, and placed on the finger, not only as an ornament for decorative purposes, but as a way of keeping the precious or semi-precious stones close to one’s body. As time went on, the use of rings for superstitious purposes diminished, but their use as symbolic tokens never has. The earliest uses of engagement rings were more for practical purposes, as opposed to romantic ones. They were primarily used to cement what was generally viewed as a business deal, between two families arranging a union for a man and a woman they considered suitably matched. This was the case with the Princess Mary of England when she was betrothed by proxy, while yet a young child, to the son of King Francis I of France. A fun fact worth mentioning is that that particular ring was actually the smallest diamond engagement ring recorded in history. The modern word diamond can actually be traced back to an ancient Greek word which means indestructible, or invincible. It’s obvious why the Greeks felt so toward diamonds, as the only thing capable of scratching a diamond is another diamond! Up until the late 1800s a cameo set in pearls, or a garnet in a gold setting were actually the engagement ring of choice for most ladies, although now, diamonds are the overwhelming favorite, and will most likely remain so for a long time. Cushion cut engagement rings are so named, because this type of cut resembles a plump cushion. It was sometimes referred to as a candlelight cut, as it was specifically cut to look particularly brilliant in candlelight. The infamous “Hope Diamond,” with its long and unusual history was a cushion cut diamond. 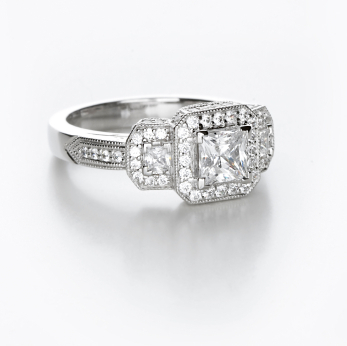 This style ring dates back to the early 1600’s and re-surged in popularity in the latter part of the 19th century. Traditionally more popular in a rose gold setting, however, that trend has changed over the years. Now there is an equal demand for this type of engagement ring to be set in yellow or white gold. This type of a cut is very rare in modern rings. There are several reasons for this, some of which include the fact that a cushion cut diamond has, on an average, 60 facets. This may not mean much to a consumer unless they know that the average modern diamond is cut in 80 or more facets. The cushion cut ring, as stated earlier, was specifically cut to look good in candlelight. Obviously this was before electric light was a factor in showing off the brilliance of a diamond ring. Modern lighting naturally shows many more flaws than those which could be seen in vintage light, and the actual cushion cut itself makes hiding flaws difficult to begin with. For this reason it has lost some popularity over the years, as cuts that were more flawless in nature were introduced. Having addressed those issues, there is a positive side to purchasing a ring with this type of cut. For the antique lover, where an individual would not expect flawlessly perfect craftsmanship, it would be an excellent choice. The cushion cut works equally well in a solitary style, or when placed at the center of a setting and surrounded by accent stones, and also displays beautifully in yellow, rose or white gold settings, where its adaptability shines. So if a bride-to-be is looking for originality and uniqueness, as opposed to simply a flawless cut, this may be the ring for her. What is The Cost of a Cushion Cut Engagement Ring? Unlike most women’s engagement rings, it is hard to arrive at an average cost for this style ring, due to the fact that the cushion cut is rarely found in a modern setting. Overall, the average price of a diamond engagement ring in general is about $3,500.00 to $4,500.00, however, this too will vary depending on the quality, and other details such as the setting and the grade of diamond used. If a certified loose diamond is purchased and mounted in a setting by a jeweler, an average 2 carat diamond ring will probably range between $3,995.00 and $11,995.00. Where Can a Consumer Purchase a Cushion Cut Engagement Ring? The cushion cut ring is rather hard to find in modern jewelry stores, or even in designer shops, but there are other ways to locate this beautiful and original style of ring. One easy solution, would be to browse through antique shops. Many couples seeking vintage engagement rings find them in exactly this manner, and are usually very happy with their purchase. There is also the option, as briefly mentioned above, of buying a certified loose diamond first, from a reliable retailer, and have it mounted in the desired setting at a future time. Certified loose diamonds can generally be found in any cut that is desired. Naturally, in this day and age, there is always the option to shop on the internet for a suitable ring, the only drawback to this type of endeavor is that, aside from pictures, the ring will basically be purchased without the consumer having the opportunity to examine it first. If this is the option taken, however, it’s wise to familiarize oneself with the warranties and return policies of the particular site chosen, and as always, a customer should never do business on an unsecured website. There is only one foolproof way to determine if a ring will fit, and that is to visit a jeweler and have a specific measurement of the finger taken. The measurement should be taken on the hand the ring will be worn on, as most people find they have a little difference in size between hands. This is not generally found to be a full half size in most cases, but for something as important as an engagement ring, it is certainly a fact worth considering. One must also take into account things like climate. A person may ask what this has to do with their ring size, but depending on where a individual lives, it can make a difference. If a couple will be residing in a very warm climate, the bride-to-be should take into consideration that her fingers may swell in the summer months. If her ring size is not exact, she may wish to take the less snug-fitting of the two choices to prevent the ring getting “stuck” on her finger. It is surprising how many jewelers comment on the various customers who have come to them for help to remove a ring that will not budge. As a general rule, wedding bands are not removed, but there are certain instances where a woman may wish to remove her engagement ring to prevent damage to the ring, or the loss of its stone. The classic formula used when searching for the right diamond is called “the four C’s,” which stands for cut, color, clarity, and carat weight. A broad spectrum of choices exist for the first three categories, and a couple must balance the amount of money they wish to spend against their minimum quality requirements. Most jewelers would say that clarity is especially critical concerning a cushion cut diamond, as they have approximately 60 facets instead of the standard 80 seen in most diamond cuts. This difference means that even minor flaws could possibly be seen with the naked eye. Once a couple has selected a satisfactory color, cut, and clarity grade, it is easy to determine the desired weight of the stone, since this choice largely depends on the budget set aside for the ring. If working with limited funds, it probably makes more sense to choose a slightly smaller carat weight, in order to be able to afford a better quality stone. This way the couple is not sacrificing the appearance of the ring in order to save money. Many couples choose to make the task of shopping for an engagement ring a joint effort, although some women still prefer to be surprised. Simply asking his fiancee her preference is probably a man’s wisest course of action. If she prefers to be surprised, she obviously does not have her heart set on one particular style of ring, and may feel a little mystery will add romance to the event. A man may also secretly ask her friends for advice and find out in this way which type of ring she prefers. He may also simply observe her preference in other types of jewelry, and choose something similar. However, if she is a lover of antiques, there is no doubt that a cushion cut diamond ring would make a perfect choice. Cushion cut diamond engagement rings, exceedingly popular in the past, are beginning to become trendy once again. With a unique shape and subtle sparkle, they are a sophisticated alternative to more ostentatious designs, yet are every bit as beautiful to behold.